You have two types of approaches: transhiatal and three fields: thoracoscopy, laparoscopy and cervicotomy. Describe the surgical technique of gastric ascent and endoscopy esophagectomy and perioperative morbidity. retrospective study, descriptive. 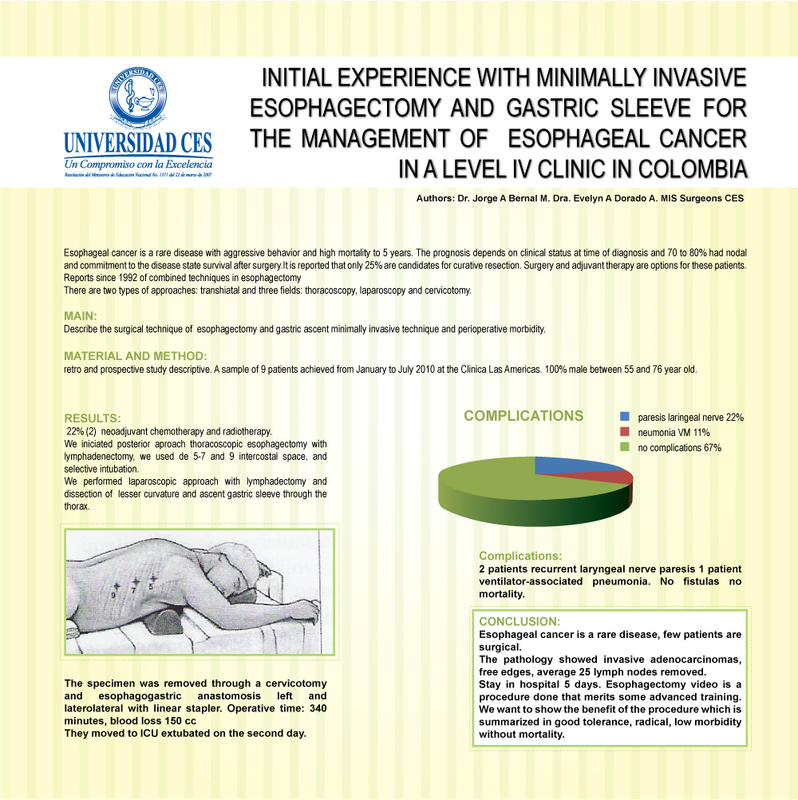 It took a sample of nine cases performed from January to July 2010 at the Clinica Las Americas. 100% were men between 55 and 76.
two received neoadjuvant chemotherapy and radiotherapy. Lymphadenectomy was performed by thoracoscopic esophagectomy with posterior approach and then lymphadenectomy was done on the lesser curvature of the stomach and tubulization laparoscopy. The specimen was removed through a cervical esophagogastric anastomosis left and laterolateral with linear stapler. They moved to ICU extubated on the second day. Complications: 3 patients: 2 patients recurrent laryngeal nerve paresis 1 patient ventilator-associated pneumonia. No patient filter or died. The pathology showed invasive adenocarcinomas, free edges, average 25 nodes removed. Esophageal cancer is a rare disease, few patients are surgical. The rise Gastric video is a procedure done that merits little advanced training. We want to show the benefit of the procedure which is summarized in good tolerance, oncological radical, low morbidity without mortality.